The beginning of a new school year brings with it a reawakening of an old debate regarding the value of homework. Parents who feel their children are overburdened with homework are pitted against educators pressed to improve achievement test scores. 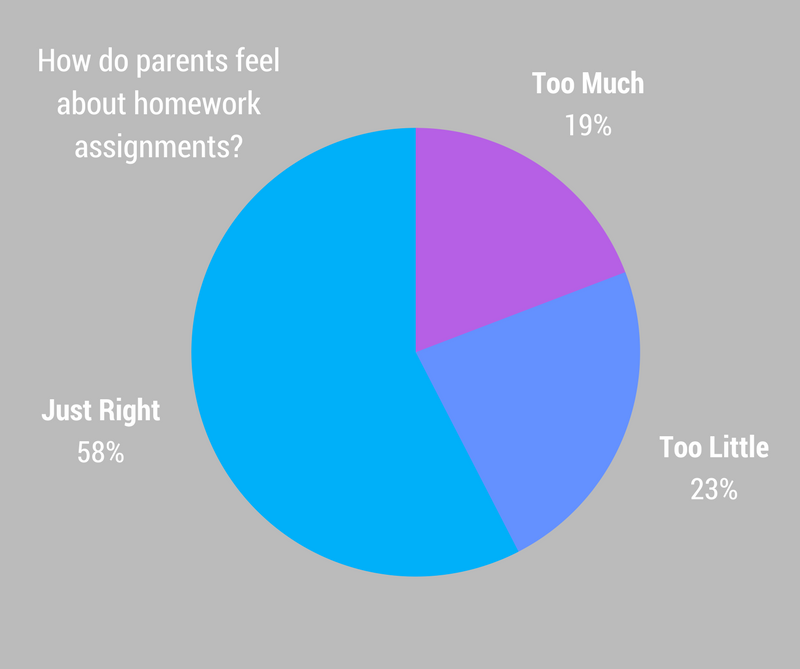 According to two recent polls, however, the majority of parents remain satisfied with educators’ homework practices. A poll conducted for the Associated Press in January 2006 found that about 57% of parents felt their child was assigned about the right amount of homework. Another 23% thought it was too little, and 19% thought it was too much. A survey conducted by MetLife in 2007 found that 87% of parents saw that helping their child with homework was an opportunity for them to talk and spend time together. More than three fourths (78%) did not think homework interfered with family time, and nearly as many (71%) thought that it was not a source of major stress. Educators should be thrilled with these numbers. Pleasing a majority of parents regarding homework is about as good as they can hope for, even with a fair number of dissenters. But opinions cannot tell us whether homework works; only research can. My colleagues and I analyzed dozens of homework studies conducted between 1987 and 2003 to examine whether homework is beneficial and what amount of homework is appropriate for our children (Cooper, Robinson, & Patall, 2006). The homework question is best answered by comparing students assigned homework with students assigned no homework who are similar in other ways. The results of such studies suggest that homework can improve students’ scores on the class tests that come at the end of a topic. Students assigned homework in second grade did better on the math tests; third and fourth graders did better on English skills and vocabulary tests; fifth graders on social studies tests; ninth through 12th graders on American history tests; and 12th graders on Shakespeare tests. Across five studies, the average student who did homework had a higher unit test score than the students not doing homework. However, 35 less rigorous (correlational) studies suggest little or no relationship between homework and achievement for elementary school students. The average correlation between time spent on homework and achievement was substantial for secondary school students, but for elementary school students, it hovered around no relationship at all. Why might that be? Younger children have less developed study habits and are less able to tune out distractions at home. Studies also suggest that young students who are struggling in school take more time to complete homework assignments simply because these assignments are more difficult for them. In this article, the authors summarize research conducted in the United States since 1987 on the effects of homework. Studies are grouped into four research designs. The authors found that all studies, regardless of type, had design flaws. However, both within and across design types, there was generally consistent evidence for a positive influence of homework on achievement. Studies that reported simple homework-achievement correlations revealed evidence that a stronger correlation existed in grades 7–12 than in grades K–6 and when students, rather than parents, reported time on homework. No strong evidence was found for an association between the homework-achievement link and the outcome measure (grades as opposed to standardized tests) or the subject matter (reading as opposed to math). On the basis of these results and others, the authors suggest future research. Cooper, H., Robinson, J. C., & Patall, E. A. (2006). Does homework improve academic achievement? A synthesis of research, 1987–2003. Review of Educational Research, 76(1), 1–62. 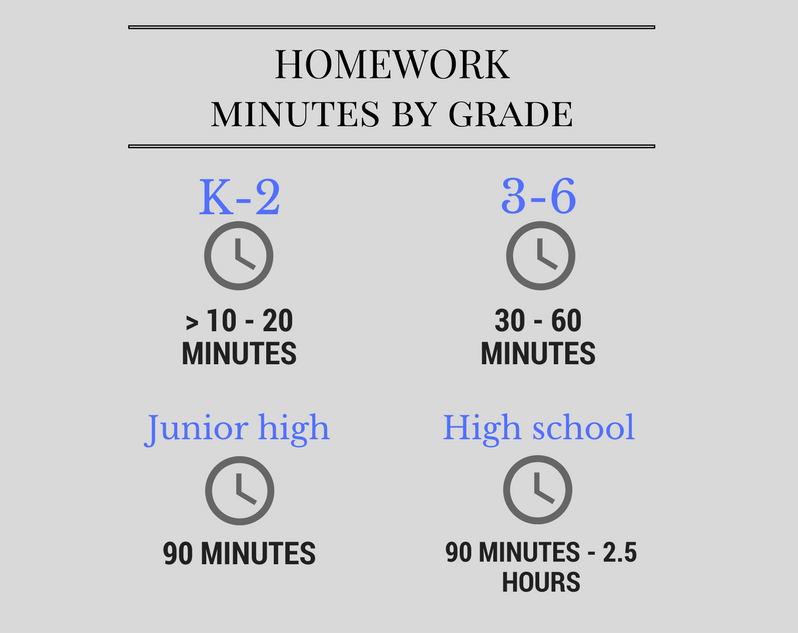 Many school district policies state that high school students should expect about 30 minutes of homework for each academic course they take (a bit more for honors or advanced placement courses). These recommendations are consistent with the conclusions reached by our analysis. Practice assignments do improve scores on class tests at all grade levels. A little amount of homework may help elementary school students build study habits. Homework for junior high students appears to reach the point of diminishing returns after about 90 minutes a night. For high school students, the positive line continues to climb until between 90 minutes and 2.5 hours of homework a night, after which returns diminish (Cooper, 1989; Cooper, Robinson, & Patall, 2006). Beyond achievement, proponents of homework argue that it can have many other beneficial effects. They claim it can help students develop good study habits so they are ready to grow as their cognitive capacities mature. It can help students recognize that learning can occur at home as well as at school. It can foster independent learning and responsible character traits. And it can give parents an opportunity to see what’s going on at school and let them express positive attitudes toward achievement. Opponents of homework counter that it can also have negative effects. They argue it can lead to boredom with schoolwork because all activities remain interesting only for so long. It can deny students access to leisure activities that also teach important life skills. Parents can get too involved in homework—pressuring their child and confusing him or her by using different instructional techniques than the teacher. My feeling is that homework policies should prescribe amounts of homework consistent with the research evidence, but they should also give individual schools and teachers some flexibility to take into account the unique needs and circumstances of their students and families. In general, teachers should avoid either extreme. Cooper, H. (1989). Homework. White Plains, NY: Longman. Harris Cooper is a professor of psychology and neuroscience at Duke University, where he also directs the Program in Education, and author of The Battle Over Homework: Common Ground for Administrators, Teachers, and Parents (Corwin Press). He is also a member of the National Partnership for Quality Afterschool Learning’s steering committee. A poll conducted for the Associated Press earlier this year found that about 57 percent of parents felt their child was assigned about the right amount of homework. Another 23 percent thought it was too little, 19 percent thought it was too much. Educators should be thrilled by these numbers. Pleasing a majority of parents regarding homework and having equal numbers of dissenters shouting "too much!" and "too little!" is about as good as they can hope for. But opinions cannot tell us whether homework works; only research can, which is why my colleagues and I have conducted a combined analysis of dozens of homework studies to examine whether homework is beneficial and what amount of homework is appropriate for our children. The homework question is best answered by comparing students who are assigned homework with students assigned no homework but who are similar in other ways. The results of such studies suggest that homework can improve students' scores on the class tests that come at the end of a topic. Students assigned homework in 2nd grade did better on math, 3rd and 4th graders did better on English skills and vocabulary, 5th graders on social studies, 9th through 12th graders on American history, and 12th graders on Shakespeare. Less authoritative are 12 studies that link the amount of homework to achievement, but control for lots of other factors that might influence this connection. These types of studies, often based on national samples of students, also find a positive link between time on homework and achievement. Yet other studies simply correlate homework and achievement with no attempt to control for student differences. In 35 such studies, about 77 percent find the link between homework and achievement is positive. Most interesting, though, is these results suggest little or no relationship between homework and achievement for elementary school students. So, how much homework should students do? The National PTA and the NEA have a parent guide called "Helping Your Child Get the Most Out of Homework." It states, "Most educators agree that for children in grades K-2, homework is more effective when it does not exceed 10-20 minutes each day; older children, in grades 3-6, can handle 30-60 minutes a day; in junior and senior high, the amount of homework will vary by subject…." Many school district policies state that high school students should expect about 30 minutes of homework for each academic course they take, a bit more for honors or advanced placement courses. These recommendations are consistent with the conclusions reached by our analysis. Practice assignments do improve scores on class tests at all grade levels. A little amount of homework may help elementary school students build study habits. Homework for junior high students appears to reach the point of diminishing returns after about 90 minutes a night. For high school students, the positive line continues to climb until between 90 minutes and 2½ hours of homework a night, after which returns diminish. Beyond achievement, proponents of homework argue that it can have many other beneficial effects. They claim it can help students develop good study habits so they are ready to grow as their cognitive capacities mature. It can help students recognize that learning can occur at home as well as at school. Homework can foster independent learning and responsible character traits. And it can give parents an opportunity to see what's going on at school and let them express positive attitudes toward achievement. Opponents of homework counter that it can also have negative effects. They argue it can lead to boredom with schoolwork, since all activities remain interesting only for so long. Homework can deny students access to leisure activities that also teach important life skills. Parents can get too involved in homework -- pressuring their child and confusing him by using different instructional techniques than the teacher. My feeling is that homework policies should prescribe amounts of homework consistent with the research evidence, but which also give individual schools and teachers some flexibility to take into account the unique needs and circumstances of their students and families. In general, teachers should avoid either extreme.